Kenya's interior minister says the government has banned all opposition protests against the country's electoral body, a day after witnesses said police killed two demonstrators. 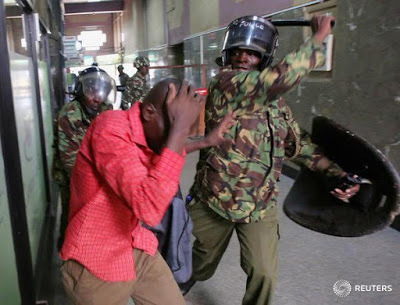 Joseph Nkaissery said on Tuesday that the chaos did not fall within the parameters set by the constitutional court, which had called the demonstrations a constitutionally guaranteed right and ordered the police to protect protesters. Nkaissery warned that there will be grave consequences for anyone challenging the government's decision. The opposition has been holding protests nearly every Monday for the last six weeks to push for the disbanding of the electoral commission, which they say is biased and corrupt. Opposition leader Senator Moses Wetangula said the ban is reminiscent of strong-arm tactics deployed by undemocratic leadership.